At least 12 people, mostly children, were killed after a boat carrying Rohingya Muslims fleeing Myanmar capsized in a river near the coast of Bangladesh on Sunday. 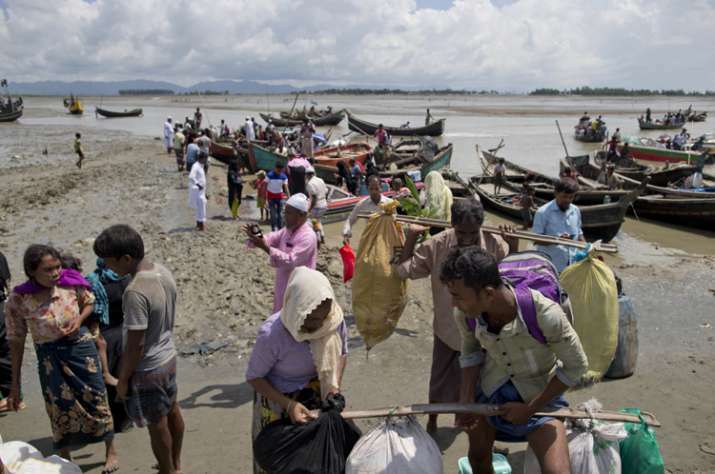 At least 12 people, mostly children, were killed and scores were missing when boat carrying Rohingya Muslims fleeing persecution in Myanmar's Rakhine state capsized in a river near the coast of Bangladesh on Sunday. Bangladesh Coast guard officials said the boat was overloaded with about 100 people when it sank in the Naf river that divides Myanmar from Bangladesh. An official was quoted as saying by AFP that around 60 people in boat were children and rest were adults. They were fleeing their villages in Rakhine for Bangladesh. The incident is the latest in the series of deadly shipwrecks involving Rohingya refugees fleeing Myanmar. On September 28, 63 people were confirmed dead or missing and presumed dead after the shipwreck of a vessel carrying Rohingyas fleeing Myanmar. Officials confirmed 23 death after recovering their bodied while 40 were presumed dead or drowned. Lakhs of Rohingya Muslims have fled the conflict-hit Rakhine state to Bangladesh and India after the escalation of tensions following a military crackdown. The UN estimates that more than 500,000 ethnic Rohingya Muslims have crossed over to Bangladesh since August 25, when an attack by Rohingya militants on police and military posts in Rakhine State sparked a crackdown by Myanmar's security forces that witnesses and rights groups say has included killing and arson. Myanmar doesn't recognize the Rohingya as an ethnic group, instead insisting they are Bengali migrants from Bangladesh living illegally in the country. Myanmar has come under international criticism for failing to stop the recent violence in its Rakhine state and in turn an exodus that has become the largest refugee crisis to hit Asia in decades.